Healthy Paws Pet Insurance is our #1 pick for pet insurers in 2016. They took the top spot because of their long-standing history of amazing customer support, their annual deductibles (versus per-incident deductibles with most other carriers) and unlimited lifetime benefits. Through Healthy Paws, you choose the terms you want to pay by deciding between your annual deductible, or a percentage of the total vet bill that you pay based on the policy you chose upon signing up. Healthy Paws also goes above and beyond by giving back to charitable organizations. Every time you get a quote or pay your premium, Health Paws will donate money to an animal in need. They also cover a wide range of conditions, such as hip dysplasia (that most other carriers deny coverage for), cancer, and other hereditary, genetic, or congenital diseases. After looking at our comprehensive review of Healthy Paws, you’ll understand why we placed them at the top of our list, out of so many other great companies. Paperless Claim Process: Everything from getting your claim pre-approved, to filing it is done online. This makes the process easy, especially when you consider the level of customer support available through Healthy Paws. Rated Best Pet Insurance For 3 Years Running: Even though Healthy Paws has only been in business a few years, they’ve managed to take the industry by surprise, and won the “Best Pet Insurance” provider award for 3 years straight. Every Policy Supports Homeless Pets: Every time you receive a quote through Healthy Paws, they donate to a pet in need. With minimal exclusions, both illnesses and accidents are covered in a Healthy Paws policy. If you have to visit the vet, you’ll be covered. Along with illness and accidents, Healthy Paws also covers both hereditary and congenital conditions, so if your breed of pet is predisposed to certain types of conditions, you’ll be covered when most other companies would deny you coverage, or turn down your claim. While most companies will deny your claim for going over the limits, Healthy Paws will provide you coverage for cancer and other chronic conditions that may require extensive treatment through your vet. If your pet requires hospitalization, the costs can quickly add up. Healthy Paws covers hospitalization and surgery. Alternative care, such as acupuncture and homeopathic treatments are all covered through a Healthy Paws plan. Instead of relying on a per-incident deductible, like most companies, Healthy Paws utilizes annualized deductibles so you know that once you’ve paid the deductible, you won’t be charged again for it during the same year for a different visit or condition. Healthy Paws’ customer service is taken to a new level. When you need to get in touch with somebody related to your policy or claim, you can use multiple options, and quickly speak to a customer service representative. Healthy Paws doesn’t want you waiting around for the vet bills to be taken care of, and offer some of the fastest claim reimbursements of all the companies on our list. They have gained a strong reputation for quickly paying out claims. 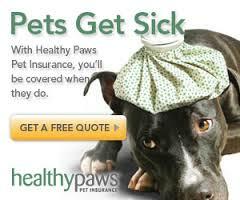 Healthy Paws has some of the most competitive monthly premiums out of any insurance company on our list. You can control the level of your premium by choosing your deductible. You can choose from a $100, $250, and $500 deductible, and the higher your up-front deductible is, the lower your monthly payment will be. Different payouts are available to help cover your total costs when you visit the vet. You can choose from 70%, 80%, or 90%, and, again, the level you choose helps control the amount of your monthly premiums. There is no limit to the amount of claims you can file against your policy. A lot of other companies on our list have high numbers of conditions and situations that they do not cover. Healthy Paws has very few exclusions, meaning your pet will be covered under most circumstances. Your claims will never be denied as long as you cover your deductible, because Healthy Paws does not have any caps on the amount of benefits you will receive. Your pet’s annual visits to the vet will not be covered through the standard Healthy Paws policy. You can offset this by knowing that they won’t be covered, and save the funds to have your pet in for the yearly checkup. All other vet visits will be covered by Healthy Paws, though. Healthy Paws has only been around the industry for a few short years. After just a few years in the industry, Healthy Paws has made a name for themselves through both winning awards based on their policies, as well as through the level of customer service they provide, and the raving customer reviews that exist. Customization over your deductibles and payout reimbursements gives you full control over the cost of your monthly premiums. With annualized deductibles, you don’t have to worry about coming up with more and more money if your pet has a new incident that needs to be covered. No claims limits on the life of the policy also means that your pet is always going to be covered. Fast reimbursement speeds and an easy claims process make getting your pet back to healthy is a straight-forward process. Multiple conditions that would also knock you out of coverage through other carriers can be covered through Healthy Paws. Conditions such as cancer, hip dysplasia, and chronic illnesses are all coverable conditions. Based on our in-depth research and comparing multiple pet insurance companies against each other, Healthy Paws is hands down (paws down?) better than the rest and is well deserving of claiming the #1 spot on our list.